Three gun competitions, which include shooting with a pistol, rifle, and a shotgun, are among the most popular. This competition has fast-paced action, unlike the traditional target competitions where targets are often static. In the three-gun competition, you score points by hitting different targets with each of the three guns. However, each of these competitions is made up by the range officer or competition coordinator, so no two matches will be the same. There is a lot of preparation that goes into these shooting competitions, with one of the most important aspects being how to get your rifle ready for competition. Shooting competition results show more than your individual talent; they also reflect time you spent preparing to compete. Even if you’re the next Jerry Miculek or Julie Golob, you’ll need to practice before heading out to a shooting competition. You’re going to need to buy a fair number of rounds, as well as some spare magazines for your rifle. If you’re planning on competing in a different state, be sure to check up on that state’s firearm regulations in order to stay on the right side of the law. Cleaning your rifle is one of the most important components of shooting competition preparation. In any sport, you are expected to take care of your equipment. It is no different in shooting sports. When you take care of your rifle, you ensure its top performance. No one wants to be the shooter that places last in an event because their gun jammed up on them. Note that cleaning your rifle means much more than simply wiping down the exterior with solvent. Most rifles come with a manual, but our friends over at Pew Pew Tactical have a pretty comprehensive guide to cleaning your rifle available online for free. When cleaning your rifle, ALWAYS make sure the gun is not loaded and take extra precaution to ensure that a loose round doesn’t make its way into the chamber. When looking at different rifles, make sure that the gun you select is suited to the rules of the competition. Stag Arms offers a wide variety of rifles and rifle parts to help shooters get a leg up on the competition. The ideal caliber of your rifle will depend entirely on the types of competitions you are planning to enter. A .223/.556 like the Stag 15 3Gun Elite is ideal for mid-range competitions (400-600 yards) as well as 3 Gun competitions. If you’re competing in long-range shooting competitions, the 6.5 Creedmoor caliber would be a wise choice. The Stag 10 6.5 Creedmoor is a great option and has shown to be more accurate and consistent, than a .308 Winchester round, at 1,000 yards. You’ll want to purchase quality optics for whatever type of shooting you choose to do. Competitive shooters choose from a variety of optics based largely on the types of matches they’re entering along with their personal preferences. For most 3 Gun competitions a setup including iron sights with a red dot or 1-6x variable power optic are perfectly fine. In the event that you’re shooting your competition rifle at longer ranges, there are a variety of high powered scopes to get the job done. If you’re participating in a power rifle (distance shooting) competition, a spotting scope is important because it is what allows you to check your target from a distance. A competition belt has various holsters that will help the shooter organize their necessary equipment, and there are various types of rigs to choose from. You also have the option of a shooting glove that will help protect the forward hand. A gun case is a no-brainer necessity, but the the type of case needed depends on your gun(s) and your personal preference. If you’re planning to fly with the guns, be sure to get a case that’s compatible with TSA-approved locks. 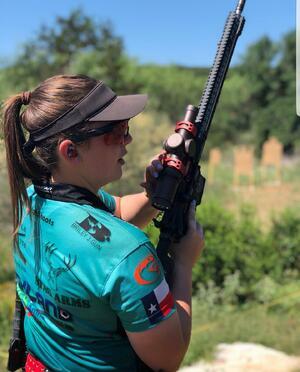 Eye and ear protection are mandatory in every competition, and most shooters like something a little more comfortable than the standard range rentals. 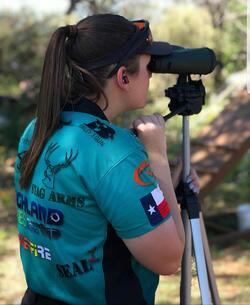 We recommend trying several different sets of eye and ear protection in advance to find the best fit for you; comfort counts when it comes to shooting competitions. Need help finding a shooting event near you? The NSSF is a great resource for competitive shooters of all skill levels.